HART is based in Pokhara and Bharatpur and is engaged in animal welfare work throughout Nepal. Himalayan Animal Rescue Trust is registered in Kathmandu as a not-for-profit company, registration number 248/066/067 and as an NGO, registration number 3571/069. Himalayan Animal Treatment Centre (UK), HAT(UK), is registered with the Charity Commission in the UK - number 1115822. This charity acts as the collection and holding point for funds raised outside of Nepal. HART exists to try to redress some of the suffering endured by animals that are without power to control their lives. Neglect, cruelty and ignorance combine to make the world a hostile place for many creatures. 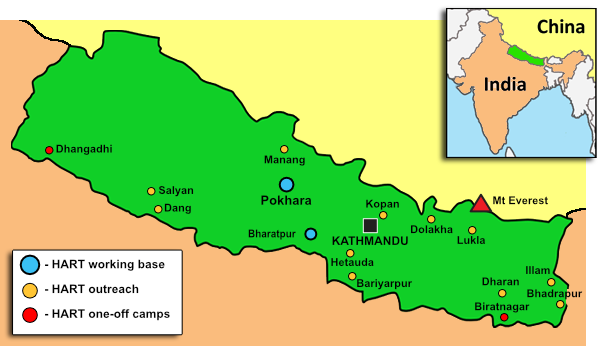 Nepal is a poor country that has recently undergone an extended period of political instability. After many years of debate the new Constitution was enacted in September 2015. Animal welfare is a low priority among many other pressing concerns. HART was established in 2010 to reduce animal suffering throughout the country from its bases in Pokhara and Bharatpur. Pokhara was originally a market town, but has grown into a tourist destination over the past twenty years. It is about 200km from Kathmandu and has a population of around 300,000 people. It's situated near Lake Fewa at the base of the Annapurna range foothills and is the third largest city in Nepal after Kathmandu and Biratnagar. There are plans for an international airport to be built in Pokhara. HART has established a small clinic and treatment kennels in the compound of the town's District Livestock Office. This is currently the main veterinary facility for small animals in the city. Bharatpur is a city in the central-southern part of Nepal, located in the Chitwan district, 126km from Pokhara and close to the popular Chitwan National Park. It is the headquarters of the district as well as a separate Municipal authority, and is the seventh largest city of Nepal with the population of around 200,000 (census 2014). Bharatpur is also one of the fastest growing cities of Nepal, showing a population increase of some 30% during the preceding four years.